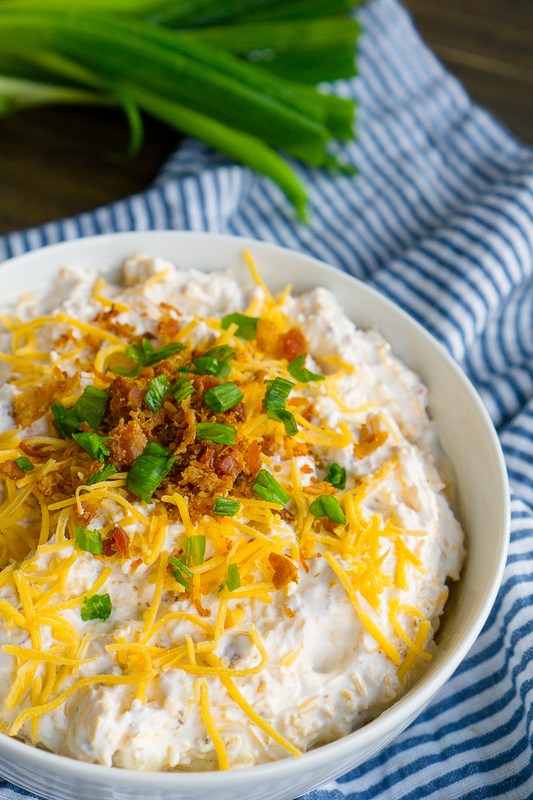 Everyone needs to have their go-to easy chip dip recipe for parties and get togethers, and this loaded potato dip recipe is mine! Add classic baked potato toppings to a sour cream chip dip base and serve on your favorite potato chip. Mix together this party appetizer in 5 minutes and enjoy! This Loaded Baked Potato Chip Dip Recipe is my top choice of party dip recipes! On this blog, we primarily do easy recipes. Recipes with simple processes that can quickly be thrown together for your friends and family – whether it be for game nights, game days, or a couples’ date nights. As the main hosts for our friends over the years, we have a list of party dip recipes that we depend on because they’re easy to make and easy to serve! 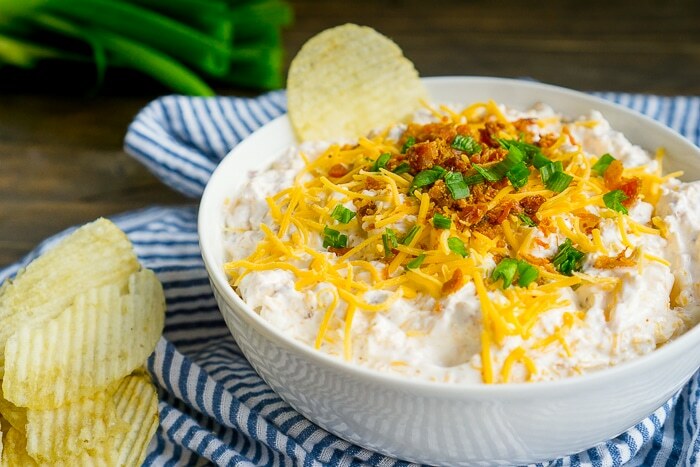 This Loaded Potato Chip Dip tops the list as our favorite chip dip recipe, and it’s always a hit! It’s easy to understand why this is our favorite – it has lots of cheese, sour cream, and bacon! I mean, you basically have me won over at bacon alone. Yum! In case you might be curious, our favorite party dip recipe that I wouldn’t classify as a chip dip is our Baked Goat Cheese Marinara Dip that I serve with warm breadsticks or crostini – it’s absolutely addicting. Our favorite dessert dips are Loaded Cookie Dough Dip or Funfetti Cheesecake Dip! This Loaded Baked Potato Dip Recipe is one of the easiest chip dip recipes you can make. Truly! The hardest part of the entire recipe is cooking the bacon if you decide to cook your own bacon crumbles instead of buying packaged bacon crumbles. When you’re ready to whip it up, toss classic baked potato toppings like chives, bacon, and cheddar cheese into a sour cream base and mix well! Add a little salt and pepper to season. If you have other favorite loaded potato toppings, like ranch, toss that into this dip as well. It’s easy to customize. For those that are wondering, the potato part of this chip dip recipe is the potato chip! The dip is pretty tasty served with pretzels though as well. We definitely like to load this chip dip recipe up with lots of cheese! I am a good old midwestern cheese addict after all! 😉 Therefore, you will want nice, sturdy potato chips! This loaded chip dip is almost always made for the Big Game! I haven’t decided the rest of our game day menu yet, but this one is an easy guarantee. Bryan pretty much asks for it every time we get together with friends for a football game and sometimes when it’s just us, too. Like I said, it’s our favorite. With only 6 ingredients and 10 minutes of prep time, how could I not make this for game day?! Meatballs are a super easy game day food to add to the menu that can be tossed into a slow cooker that adds a nice, hearty protein to the menu. We like ones that are cocktail sized for a bite sized appetizer but it’s always nice a big enough serving feels more like dinner. Our favorites are Peach BBQ Meatballs, Honey Sriracha Meatballs, and homemade Buffalo Chicken Meatballs. When looking for something more meal like, we like adding flatbreads onto our game day menus as well. We usually toss them together quickly beforehand and then put into the oven when we are ready to enjoy. They’re easy to make and especially yummy! With friends over, we usually make either Buffalo Chicken Flatbread or BBQ Pork Flatbread. If looking for ways to add lots of veggies to the menu, you could also make a Cream Cheese and Dill Veggie Pizza! 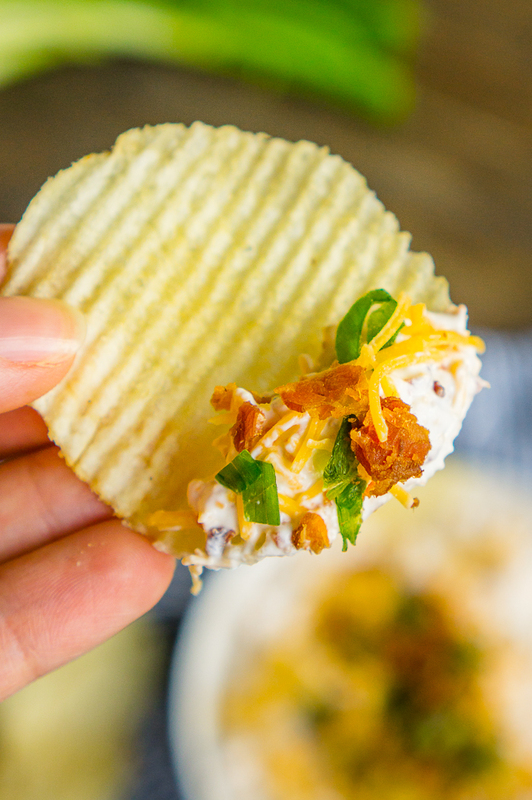 Time to Get Party Ready with this Easy Potato Chip Dip Recipe! Our favorite easy chip dip recipe for parties and get togethers! Add classic baked potato toppings to a sour cream chip dip base and serve on your favorite potato chip for a tasty Loaded Baked Potato Dip everyone will love! Cook bacon and crumble or chop. Combine all ingredients except for potato chips into a medium bowl and stir heavily. Refrigerate for at least one hour before serving to allow chip dip to set. Garnish with shredded cheese, crumbled bacon and green onions on top. Serve with your favorite potato chips. Darwinism. Or Surviving Cold and Flu Season with Kids! I have not seen this dip using real bacon, I have always made mine with store bought bacon crumbles. I will definitely have to give this a try by frying up my own bacon. I love it with dry ranch packets mixed in to it too. Definitely one of my go to dips as well it is always a big hit at parties. What a great snack idea!!!!! Maggie, this looks amazing! I love loaded baked potatoes but never thought to turn one of my favorites into a dip. I can’t wait to try this! I hope you decide to try it, Sarah! It is one of our absolute faves. My friend made it for her family during the holidays, and they now ask her to make it every time! You are fabulous, Cindy! Thank you. Ummm… so going to be making this! Thanks so much for sharing it with us this week at Monday Funday! This looks delicious – and quick! Thanks so much for sharing at this week’s Whip It up Wednesday party. I look forward to seeing more from you in the coming weeks!